I play an EWI. That is, an Electronic Wind Instrument. It is an electronic version of a saxophone. You blow in the end of it and press the keys as if you were playing a real saxophone, and the synthesizer makes it sound like any instrument you want. Anyway, there’s a lot of stuff to carry around to rehearsals and gigs. This case was my first attempt to simplify moving the equipment around and was built to transport the instrument, synthesizer, and cables. It also holds the synthesizer in a convenient position while playing and serves as an instrument stand between songs. Later projects add amplifiers, speakers, and batteries. Nice work on all the cases. Custom made to work for you is the best. Ted, this is a nice practical project. Congratulations and welcome to Lumberjocks. 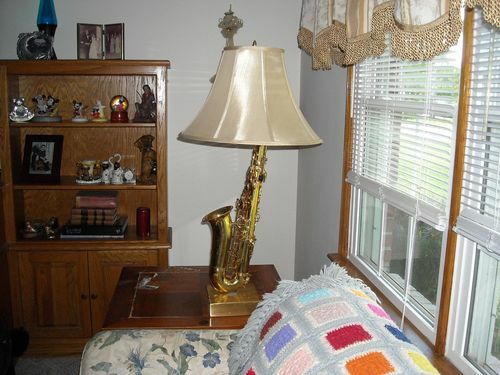 An electronic Sax? Hmmm, dont think I’ve ever heard of that. Do you play the “regular” Sax? I played all thru Jr hi and Hi school, but it’s been 40+ years since I played. I just converted this old Alto (which was unrepairable) for our living room.